-8/6 minutes read- A travel story about the mesmerizing train journey from Kandy to Ella. Including travel tips for a DIY journey. Interested in the travel tips only?! Scroll down to the second part of this blog post. Two small, rectangle cardboard tickets provide us entrance to platform. The train is yet to arrive, so we join the mix of locals and tourist waiting on the small strip leading to the railway. It’s crowded today. Uplifting music comes from the speakers, adding a kind of excitement to the setting. But together with the decorative framework, a characteristic old train at the opposite platform and the specially designated foreigner restrooms I get the slight impression of being in a fun-park instead. Waiting in line for the next attraction. And immediately I hope this journey is more than just an tourist destination. While we wait the crowd increases. 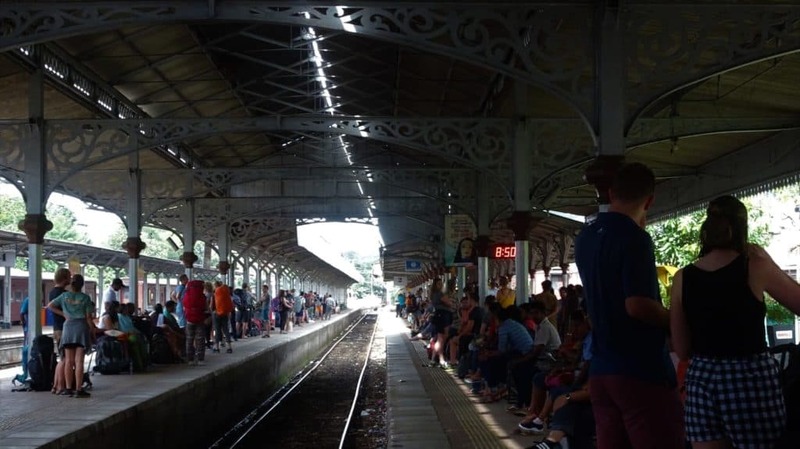 More and more people gather and take place on the platform. In an attempt to secure two seats I address the conductor. ‘Excuse me Miss. Where should we wait for the second class carriage?’ She hastily replies; ‘The second class is sold out. You better try a third class seat’ Looking at our second class tickets we hesitate. But then considering the crowd we get what she’s saying. ‘Where can we find the third class carriage?’ I reply to her. ‘It’s right here’ she smiles. A distant horn announces the train’s approaching. We gather in front of the track while the train stops screechingly. Lucky as we are the door stops right before us, allowing us to be one of the first to board. Happy with the conductors advice we quickly occupy two of the sparse, empty seats. Our luggage conveniently stored in the narrow rack above us. A second loud horn is followed by motion. Let the journey begin. The train is loud and shaky. 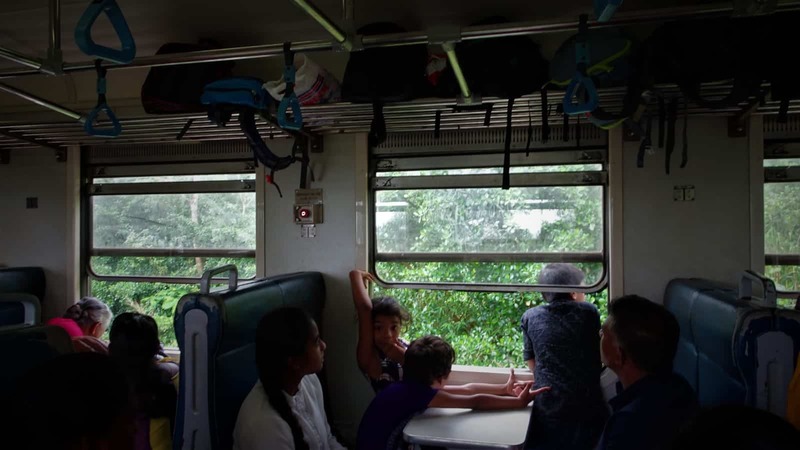 But the general mood is good in the third-class unreserved express train. A group of young Sri Lankan hikers are dancing and singing. And locals welcome us with kind smiles and waving hands. The spacious enough seats are equipped with head-support and promise a comfortable journey. Dense jungle on both sides appears almost instantly as we depart. And large palm trees full green and yellow coconuts give an extra tropical vibe to the setting. When after a while the windows open, a cool breeze enters the carriage. Almost instantly Amir hangs his head out of the window and avoids passing greens. Inside the carriage I meet two large brown eyes staring at me. They’re from a child that curiously looks my way. Simultaneously a lady with wrinkled face and gray-white hair gives a friendly smile. She looks sophisticated in her purple sari and pink blouse. While we greet a voice enters the coach as well as a mild-hot aroma; a man in blue-white checkered sarong sells fried dhal snacks on a bed of chilies. The vadai’s sold in paper pouches made from old schoolbooks. The journey is lovely already, but becomes wonderful when I’m offered a seat near the window. A comforting cool wind hits my face while the jungle comes alive right in front of me. Palm trees, plants and shrubs make way for a tall pine-tree forest. As well as a small river, before the jungle takes over again. 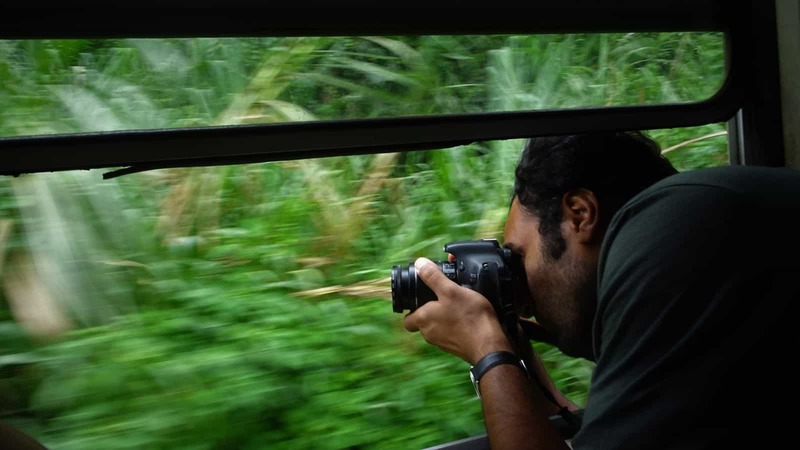 The views on the moving train, as well as the dense jungle and the sensational wind are captivating and boost my spirit. 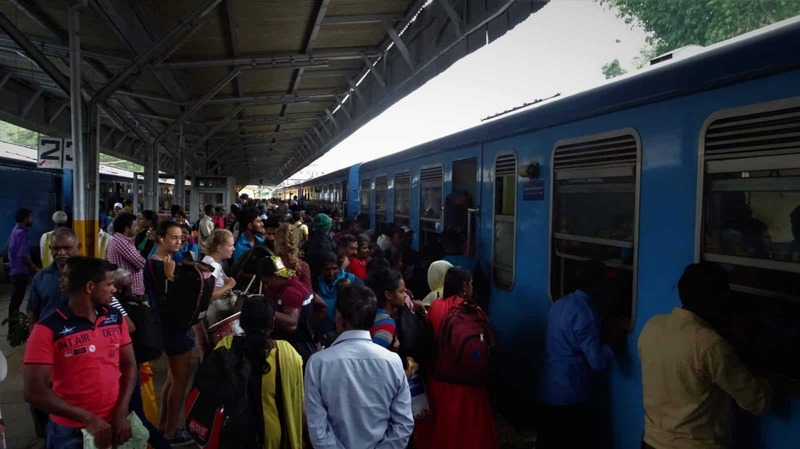 When the train stops at a station new faces and a change of seat bring new dynamics. A fresh scent of wet grass and forest enters the carriage and mingles with the sweet scent of mangosteen, eaten by another passenger. It’s damp outside, and it starts to spatter. Changing the atmosphere from mildly hot to slightly sultry. Besides soft splatter and the zooming sound of rotating fans I also hear the chirps and buzz of small jungle-bugs around. As well as the swirling sound of a distant river. With tingling senses, pleased to be surrounded by nature, I state into the green while we wait. 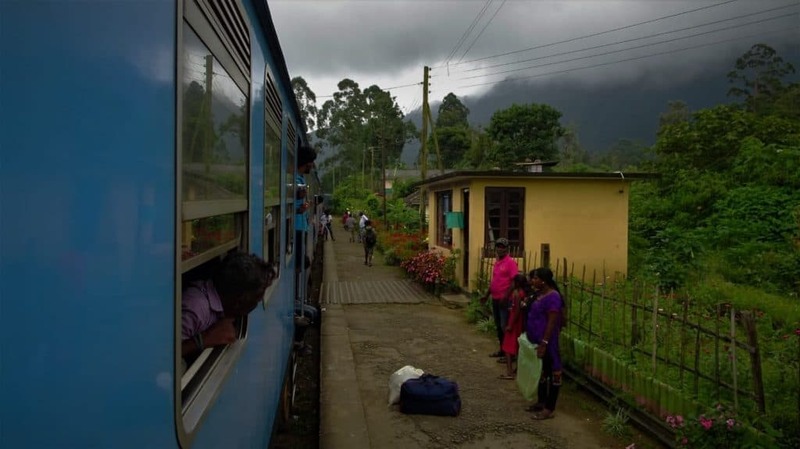 After a slow hour the train continues and climbs meters into the hilly and mountainous landscape central Sri Lanka is rich. An enchanting pine-tree forest, covered in a captivating smoky mist, reveals in front of our eyes. Clouds consume the train from both sides, making it impossible to follow the track. A cold wind blows through my hair as we bypass the trees. And for a moment I’m on top of the world. Mesmerized by the view and the trains motion. Riding on a last piece of land, wrapped in a white mist. With rhythmical sound we’re led along the first tea plantations. As well as small, isolated villages with stone houses and corrugated iron roofs. Children wave and villagers look as the train passes by. There are waterfalls, trees, endless plants and greens. Riding under the clouds, overlooking the trees the impression of riding on top of the world is lasting. As we slowly decent a full view treats us with immense tea-fields. Hills covered with waist-high tea plants, kilometers far and wide. Neatly planted in rows. Leaves look fresh and green, ready to be handpicked during the flush. Only colorful houses and villages in salmon pink, light blue, green and yellow interrupt the endless green terraces. Signs of ‘Tea Estate’ appear as we are passing. There’s no way around it; we’ve entered the tea country. 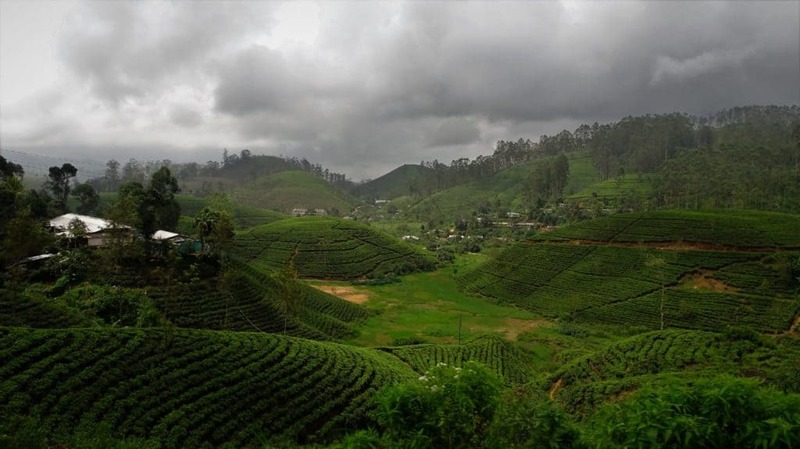 Known to be one of the finest tea producers in the world, Sri Lanka is famous for its handpicked tea. Grown at several elevations country wide, the tea is classified by altitude. Being exposed to long periods of intense heath, the low-grown ones have a robust flavor and dark black infusion. Mid grown tea, on an altitude between 600 and 1200 meters has a softer but intense rich taste as well as a vibrant copper color. Yet the finest tea, soft in taste and with intense aroma, are the copper-gold high-grown infusions. 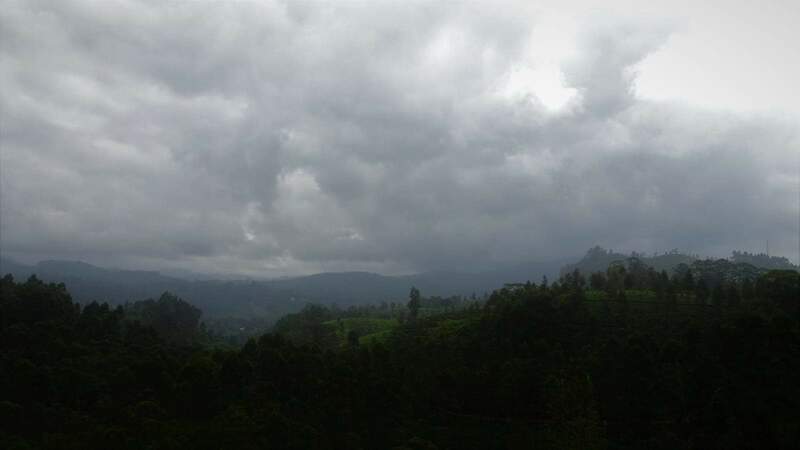 Grown at an altitude above 1200 meters, it’s the fresh, thin mountain air as well as high humidity and rainfall that leads to the complex and delicate flavor Sri Lanka’s teas are famed for. Enchanted by the fields of green I barely notice the increase in buildings. And shake up when all of a sudden the train stops and people start to move. ‘You need to transfer here’ a passenger, apparently knowing our destination points at the opposite platform and informs us while he passes. A little confused we pack our bags and get off. It’s crowded at the unknown station but we don’t need to wait long. People start moving as they hear the train approaching. Lining up quickly to conquer their seat on board. Without hesitation I pack my bag, join the crowd and walk along the train while it slowly stops. Years of train travel are paying off as the door once again stops right in front of me. But even before the passengers leave the train, people are already pushing. Promising it to be quite a struggle to get in. Pushed to the side of the door, we are waiting in front of an open window when I see a local securing his seat by placing his bag through the window. ‘Give me your child’ he says to a Chinese lady in an attempt to help her get a seat. His arms already reaching. The lady is hesitating, but I don’t think twice. And push my bag through the window into the hands of another passenger. Who carefully places it on the seating. Still pushed around I’m about to climb through the window myself, but Amir holds me back as the line now is moving. Smoothly I squeeze myself between them, rather climb my way to the seat and thank the kind local who kept my luggage safe. What an exhilarating way of boarding! Cram-packed the journey carries on. But seated by the window we’re good to go. It takes only a fraction before once again I’m dreaming away over endless fields of tea, jungle, waterfalls and fog. As well as tall, famous bridges and long tunnels where people shout and cry from excitement. 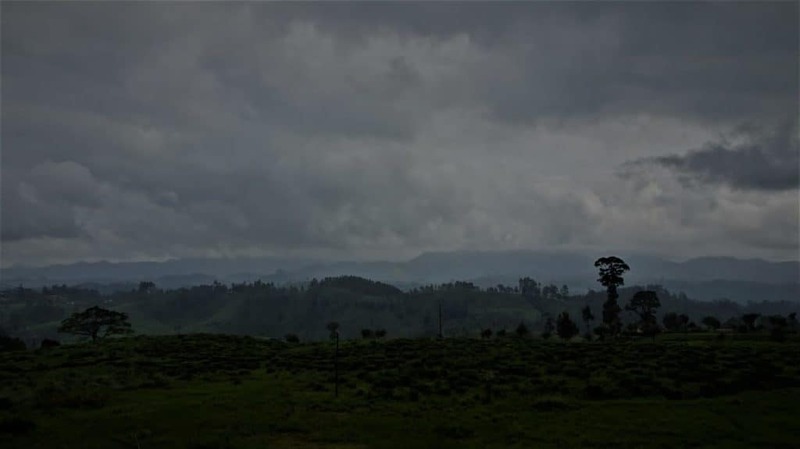 Crawling at different elevations, veiled in clouds and mystical mists. Experiencing a train journey on top of the world! 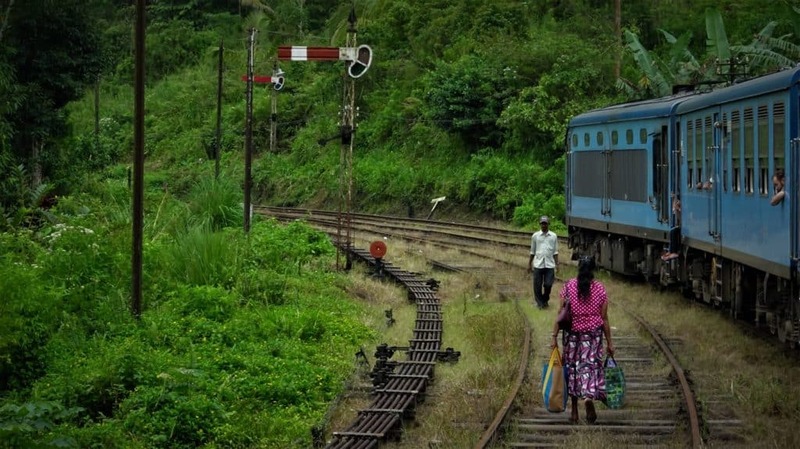 Much has been said and written about the train journey between Kandy and Ella. 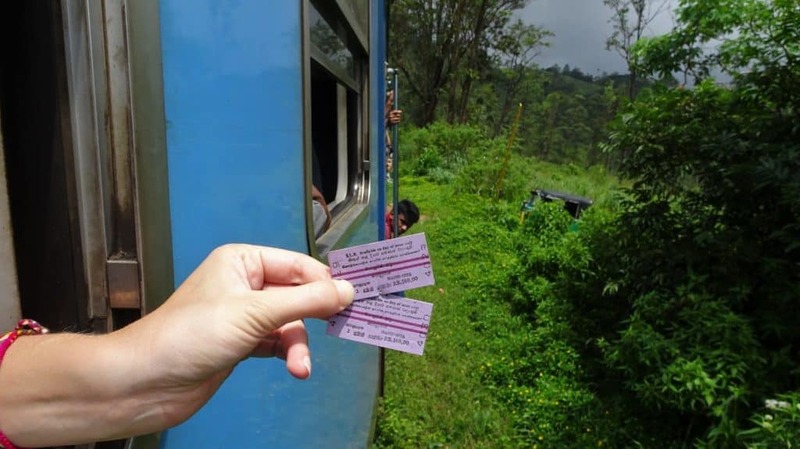 And although many tourist find their way to this magnificent journey; those who are able to catch a window seat are in for a treat of a lifetime. Looking for more inspiring travel stories? Be sure to check this page with some amazing stories for you to read. Rather know how to organize this trip yourself? Keep on reading to find the best travel tips and all the information you need to plan this mesmerizing journey! DIY Travel Tips; a guide to your Ella- Kandy journey. 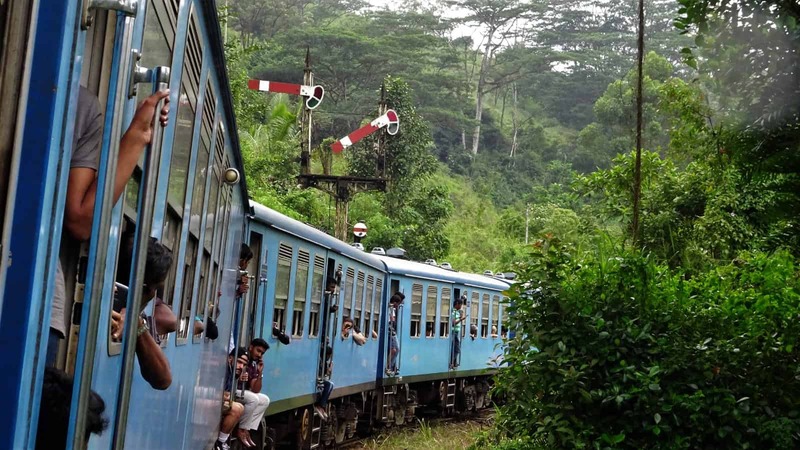 Often described as one of the most scenic train rides in the world, the train journey from Kandy to Ella (or vice-versa) simply shouldn’t be missed while visiting Sri Lanka! Make the most out of your journey by using the information and travel tips listed below. Reserved first and second class can be bought up to 30 days in advance. Because tickets sell out soon it’s best to buy them early through an online service provider. By guaranteeing your seat, expect to pay around 10 times the fare compared to unreserved tickets. Unreserved second and third class tickets can be bought at stations until departure. Yet, as second class also tends to sell out either show up a little early, or opt for a third-class instead. Expect fares as low as 230 or 125 rupees, depending on the class you choose. Worried about getting a seat?! I’m happy to share some great advice about this in the travel tips below. The first class non-AC observation car; featuring a large observation desk, this carriage offers the best panoramic view on the railroad and surrounding. Allowing you to open the windows gives you the ultimate freedom to point and shoot from the convenience of your reserved chair. Second and third class carriages also come with open windows and even with open doors for that matter! 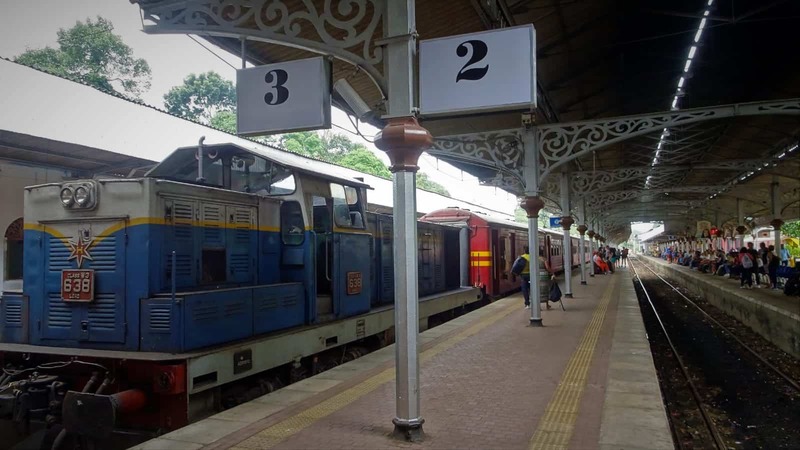 Whilst second-class seats are more spacious and have more advanced head-support, I experienced the third class also to be comfortable enough to travel with. Besides being cheaper options, traveling unreserved allows you to be flexible in your travel plan. That for me is a huge benefit! Additionally, traveling third class really allowed me to meet locals and experience local life. And that in itself is one of the reasons I go traveling. Ask the conductor where your unreserved carriage is. Knowing exactly where to board increases your chances on getting a seat. If the second class is sold out or looks like it’s going to be full, try your chances at the third class carriage. As most people try to avoid third class, it might be a lot less crowded there. Given that the journey is generally beautiful, choosing your seat wisely can definitely add to the wow-factor and enhances the mesmerizing experience. 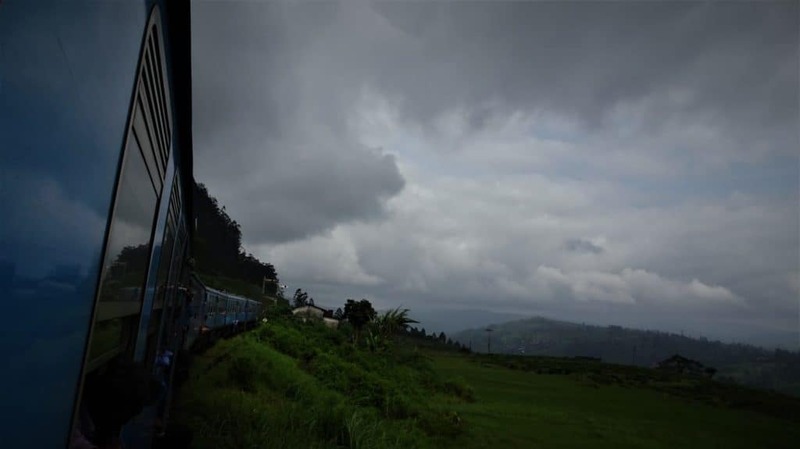 Sit on the right side from Kandy to Nanu-Oya (closest station to Nuwara Eliya) and be treated to the endless fields of tea, as well as the panoramic vistas described in the story above. Whist the left side will treat you on high grass and cliffs from time to time. Contrary, the stretch from Nanu-Oya to Ella is best to be observed from the right side. Although it is written everywhere that the journey takes around 6-7 hours, from experience I can tell you that it might just take a lot longer! Just the first stretch, from Kandy to Nanu-Oya took six hours alone, and then another four to five hours was easily added! To keep the journey enjoyable; plan a stop somewhere along the way. 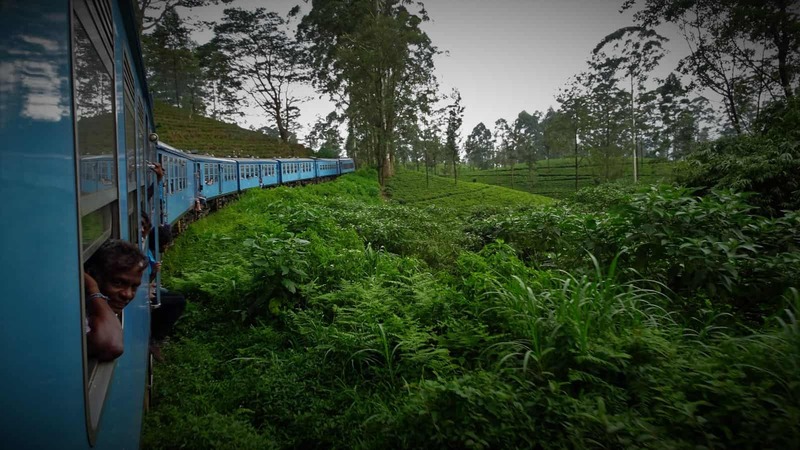 Visit some of these stunning tea-plantations and experience the cool, humid climate in Nuwara Eliya (get off at Nanu-Oya) or get off at Hatton to climb the Adams Peak. There’s no need to go to the train station hours in advance. Trains are often delayed and chances that the unreserved class completely sells our are minimal. 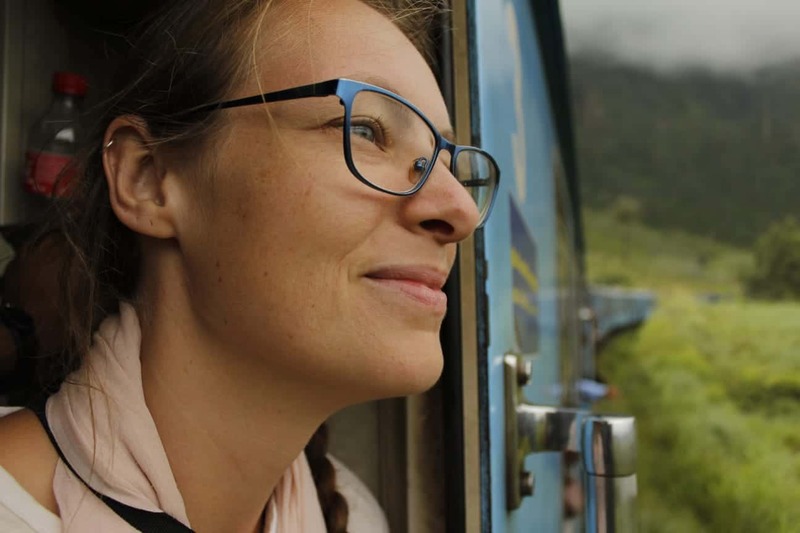 Don’t be afraid to travel third class; you might just get the most authentic experience traveling with locals! Keep your tickets safe until after exiting the station. The staff will ask for it once you exit the train. Try to travel light; the train only has small overhead luggage racks and overall limited space for storage. Bring some drinks and snacks with you, and in addition get some from the in-train vendors. 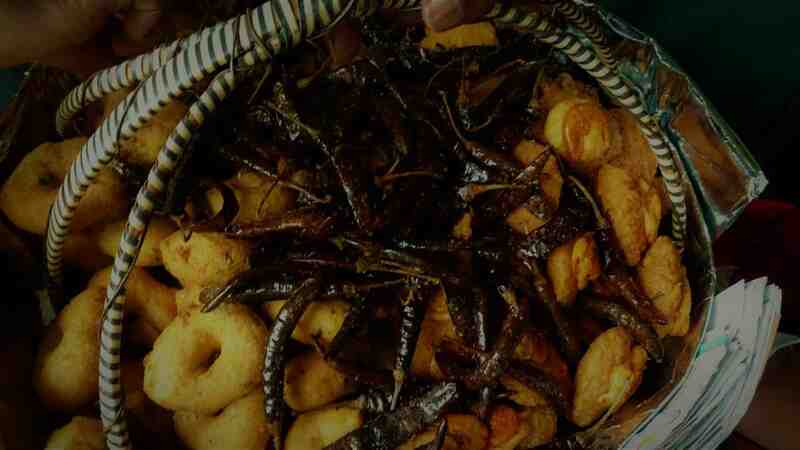 Carry some small bills to buy fresh, in-season fruit, spicy peanuts or all kinds of fried vadai. If, for any reason, you were not able to get a seat; try to board as one of the last and stand in the door opening instead. Looking for other inspiring ways to roam around the country? Be sure to read this blog post with eight transportation tips to roam the island on a budget. Nice summary an excellent tips! Thanks! I have done parts of this route and remember it as a mesmerizing adventure!! Time to go again!